I know a lot of people grumbled about not getting a vanity pet this year for wow’s birthday. I didn’t really mind as although I like free pets I’d at least like to do something to obtain them, I seem to appreciate the ones I have to quest for or get through reputation more. I’ve been happy to find at least four that can be had just through quests. Withers is the reward for completing Remembrance of Auberdine I followed the comments posted by sunsmoon to get him. There are quite a few quests involved but if you are a high level it goes pretty quick. He shrinks over time but can be restored to his former size by immersion in water! 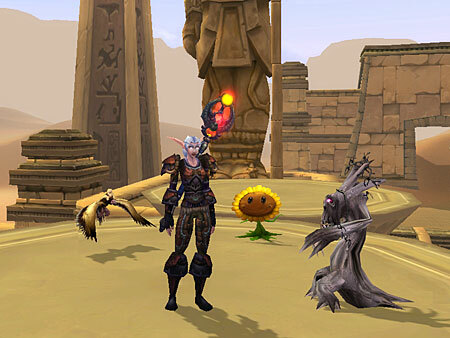 Brazie’s Sunflower is the reward for the last quest in a chain you can get from Brazie the Botanist in Hillsbrad foothills. What’s not to like about getting to play Plants vs Zombies in game. The last quest Lawn of the Dead took me a few tries but it was worth my Sunflower, the only downside was at least that character couldn’t play the game anymore! This one took me by surprise I didn’t even know it was a reward for the quest until I was finished. When you complete Egg Wave which is the final quest in a chain that starts with The Hatchery Must Burn in Mount Hyjal you get a choice between a Gold Mini Jouster or a Blue one and you get an achievement, Beware of the ‘Unbeatable?’ Pterodactyl also on completion. The one I’m working on now is Pebble. The achievement Rock Lover, rewards you with your own Pebble after you complete Lost in The Deeps, rescuing Pebble ten times. Seems only fair I’m sure you and Pebble will become close after all those harrowing escapes. I haven’t been to Vashj’ir so I don’t know if there are any similar quests or achievements to be had there but I can hope! I don’t know what it is about Cataclysm but I find myself slowing down, not really in a bad way I just don’t feel any urgency to quest, to gear up, any of the things I did in past expansions. It could be that playing when all the other older players are at work or being in a one and one half person guild could have this effect but those conditions occurred in past expansions too and I did feel the need to level, gear, whatever. It might be knowing that if I don’t race with the pack I will still be able to complete a zone because outside of Crucible of Carnage I haven’t run into any group quests so the need to be in the first wave so that there will be people to do quests with is gone. My poor warlock who was born in May 2010 spent a lot of time and repair bills trying to do the two first bosses in the Amphitheatre of Anguish alone to complete the zone, first boss was fine, second maybe eight tries, lol. The fact that new players will be able to complete a zone is nice, I like it, although I do miss the group quests. Maybe it’s all the random flying around for Archaeology, I feel disconnected from the rest of the world, I have a whole other agenda now, digging up stuff and along the way I stop to look at the sights. I’ve never had the patience in the past to actually grind the mats when I wanted to make something. I have now, and happily I might add, personally collected 125 volatile airs to make two rings, I would never have done that in the past but now I seem to be happy grinding air for a while in Uldum then taking a fly around checking for the Mysterious Camel Figurine and then … just … fishing, yes fishing. One of the changes I don’t like is the segregation. Were the Alliance and the Horde getting too cozy? With all the apparent strife in Azeroth (how can there not be with Garrosh Hellscream and Varian Wrynn in charge, I mean geez, two bigger hotheads you’d be hard-pressed to find) I guess we can’t get together in a place like Shatt or Dalaran anymore. I miss it, it was the only time I could /wave and /hug my friends that changed sides. Is this just me? Is this intentional on Blizzard’s part, some kind of grand plan that I can’t see or is this something that just happens to you by your third expansion? Oh well, it’s off to that nice beach over by Schnottz’s Landing for me. I’m going to set out my umbrella and drink my South Island Iced Tea and think about it some more or not, whatever. Just in case anyone else is stuck in this predicament I thought I’d share what worked for me. My druid went through Uldum without a hitch but while I was there I heard a few people say they were stuck somewhere in the Harrison Jones line of quests. Well my hunter just got stuck there too. I was in the Chamber of Stars, turned in the rope to Harrison and that was it, no more quests. After flying around and around the room I finally found a dead body with the quest Lessons from the Past and was able to continue, whew, but I remember a quest to kill scarabs that the druid did and I thought it was in the Chamber of the Stars but maybe not, I was just happy to get unstuck, lol, I like Uldum and didn’t want to leave it half-done. I was flipping channels the other night and stopped briefly at NCIS LA cause I saw Linda Hunt who I like on it which made me remember the first time I saw her in The Year of Living Dangerously and spent the whole movie trying to figure out whether she was male or female. I didn’t post last week because all I had to say was either whining or moaning about something and I was going to spare you that but hey, why not, so you’ve been warned. I’m going to whine and moan about my week of wow going wrongly. Okay I’m going to start off small, the cooking dailies, that freaking cooking daily, and you KNOW which one I mean, that stupid, stupid confectioner’s sugar. And I don’t know for the life of me why I can’t remember that some NPCs sell this which would alleviate some of the agony if I’d just remember. Who on earth thought that having sugar spawn in only four locations would be a good idea. Every time I find a location without someone already camping it I seem to draw mean-spirited people that want to get into a clicking contest. As soon as the server’s are back up I’m going to go buy all the sugar I can find, the next time Orphans Like Cookies Too! comes up I’m not going to be unprepared again. 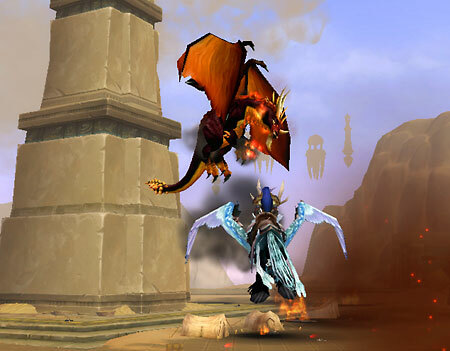 Now this one is more serious, way back before Cataclysm launched I read about Vial of the Sands and was so excited. Now as you see if you read Wowhead’s listing it clearly states that the recipe drops from Canopic Jars which means you’d need to have Archaeology maxed. In fairness to me maybe this info has only been up since launch because I sure didn’t know it. I hurriedly got my alchemist up to 525 and then um, where’s the recipe? That’s when I discovered she’d have to max Archaeology. This wouldn’t be so bad except I already maxed it on my druid and really didn’t want to do it again. Oh well, here we go again and I also found out that when it comes to Archaeology your mileage may indeed vary, that druid was really lucky, yes, she really loves Archaeology, psst, I wonder how much she’d like it if she had gone to 205 without a single rare so far, nothing, nada, zip. Anything else go wrong, yes, my poor goblin finally stopped riding around with her homies and got to Orgrimmar spoke to that utter jerk, Garrosh Hellscream and is now living in a tenement, she’s not feeling any Horde love at all. I guess sometimes virtual life mirrors real life in that sometimes you just hit a spell of things going wrongly, sheesh. Oh, oh, I almost forgot. I’m beginning to think it’s impossible to complete The Crucible of Carnage in a pug but that’s a post for another day. Most of us probably have to deal with some kind of aggro be it wife, girlfriend, husband, whatever. My son-in-law had first girlfriend, then wife aggro. This resulted in his playing wow in the wee hours of the night and getting just a teeny, tiny bit of sleep which resulted in him dozing off during the rest of the day causing further aggro. I worried that he’d be dozing off while driving to work or something. We both tried to interest my daughter in playing the game but she just never had any interest in smiting, stabbing, nuking or face melting anything, geez, what’s up with that. For four years I’ve tried to interest my husband in wow. I have since given up, it’s not happening, I must except that. If this were a game that re-enacted great World or Civil War battles I might have a chance but then I wouldn’t be interested so there you have it. I have husband aggro, at least that’s what I tell people when I have to get off, it’s more simple than having to try to explain it. I’m not sure if it really qualifies as aggro but it has the same effect. My husband is really very tolerant of my habit. 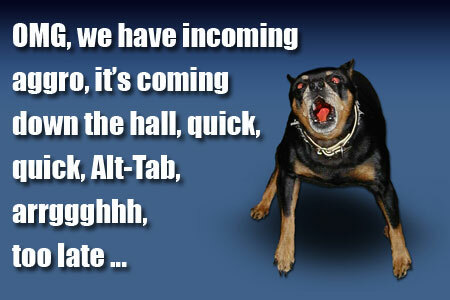 The problem is if he’s at home and I login I probably have about another half hour to do anything constructive. Within an hour he’ll come up and get on the other computer and start watching You Tube or something else equally bandwidth intensive. He always says “This isn’t disturbing your game is it?” and I always say no, and then go finish any business I have at the auction house or, well, I can fish. Some would say that he does know that watching videos is disturbing my game and it’s some form of passive aggression but I prefer to think he likes my company and who can complain about that and on the bright side I don’t know if I’d have ever reached 525 fishing skill without him. I came across an interesting series of posts at Ironyca Stood in the Fire about gender-bending while gaming. I had to think about it but then I remembered way back making a Night Elf rogue. He didn’t last long, I don’t really know if he didn’t last because he was a Night Elf male, a male or a rogue. I then remembered making a Blood Elf male Death Knight. I definitely remember why he got the axe. I know it’s silly but I couldn’t stand the way he jumped. I like to jump and his jump was so embarrassing, I don’t know, this may have just been an excuse to delete a character I was uncomfortable with. I do know that in their short life I tended to treat the males very similarly to the way I treat my poor (not even in the picture above) female Death Knight. She tends to get upgrades only after everyone else does. She’s a Death Knight she wouldn’t like it if I babied her. And that’s another thing, a thing that I have to watch around my family lest they become unduly worried about my sanity. I refer to all my characters as “she”. I’ll say things like she doesn’t fish, she’s too lazy. That character isn’t very friendly, or that one is friendly. Yes, I have attributed characteristics to them, not on purpose but as time passed I noticed that while playing a certain character I’d be more likely to respond a certain way. I have theories on why this might be. Some of these characters leveled in a ghost world, some of them leveled in the earlier days of my server. The Warlock was my last character to level to 80 before the Cataclysm and with the exception of about a week where she (oops, I) met someone in Hillsbrad Foothills and leveled together before they blew past me (I was taking my time to see the world one more time) she pretty much never interacted with anyone and she’s not very friendly. My Druid on the other hand was not my first character but there were still people leveling when she came through the world. She’s more likely to stop and buff someone, or throw you a heal while my Shaman is more likely to /rude you than to heal you. I don’t know if this speaks more to my mental state or the difference of the leveling experience of my characters but if you run into any of them, you need a favor, ask the Druid, the Shaman is liable to /moon you. And no, that’s not all my characters on this server. My Priest, Mage, and Death Knight didn’t make the cut and boy are they pissed.